Long-time readers know that I’m something of a browser fanatic. (There are presently 30 or so installed on my Mac). Perhaps my interest in anything related to Web browsers has its roots in the dark old days when (shudder) Internet Explorer was really the only Mac browser. Whatever the reason, if there’s something new in the browsersphere, I’m interested in it. Recently, that meant taking a look at both Safari 4 and Chromium. 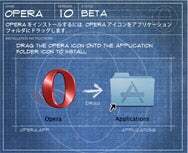 Now comes word that Opera has released Opera 10 Beta. I’ve had Opera on my machine for years, and would occasionally use it, mainly to make sure my sites were at least readable for someone using it. I was never really comfortable with the user interface, though; it just felt disjointed and not all that well put together. After downloading the Opera 10 beta, I had a feeling things were going to be different as soon as I mounted the disk image—whereas Opera 9 features a disk image set against a bold, garish red background, Opera 10 Beta has an easy-on-the-eyes architecturally-influenced blue background. The changes are immediately noticeable and quite welcome, even though they’re relatively minor individually. The tab bar has been reworked, and it’s now much easier to see the break between tabs. The active tab is highlighted with a nice gradient, instead of just a flat gray color scheme, and tabs are more clearly connected to their page content. Toolbar buttons have lost their garish colors, replaced with standard Mac-like gray-and-black buttons. Various boxes (URL entry, for instance) have also been reshaped to match the Mac standard. Once you get beyond the pretty new skin, there are numerous low-level improvements. Pages load up to 40 percent faster than in Opera 9, and Opera 10 Beta scores a perfect 100 out of 100 on the Acid3 test (something that only Safari 4 Beta has done, as far as I know). SVG handling is also greatly improved, as is support for web fonts. I compared a few resource-intensive pages in both versions of Opera, and Opera 10 Beta was noticeably faster. For those on slower connections, Opera 10 Beta now has something called Opera Turbo. According to the company, Opera Turbo “easily delivers 3x to 4x the speed of slower connections and can offer broadband-like speeds on dial-up.” I don’t have dial-up here at the house, so I can’t test the claims. Enabling it on my broadband connection didn’t have any appreciable impact, one way or the other. I like this solution; it allows use of thumbnails when desired, yet they’re easily converted into tabs when you don’t want them. 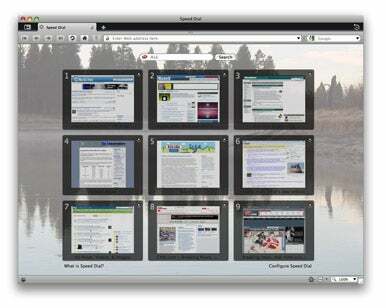 Opera 10 Beta also sports improvements in the often-copied (see Safari 4) Speed Dial page. You can now choose a number of layouts that display four, nine, 12, 16, 20, or 25 icons. You can also select your own background image, as seen in the image at right. As was the case in prior versions, you can easily rearrange the page by simply dragging the thumbnails to your desired locations. Opera 10 Beta includes new Web integration features that acknowledge the emergence of Web-based services to replace desktop apps. For instance, if you’re a Gmail user, you can tell Opera 10 Beta to use Gmail when you click on a contact link on a Web page. You can do the same thing with RSS feeds, and point them to your favorite Web-based feed reader instead of a desktop app. There are lots of other minor changes in Opera 10 Beta. The search box is now easily resizable via a drag handle, there’s a built-in spell check (though it doesn’t use the OS X system spell check), enhanced e-mail sending, automated crash reporting, and and improved Dragonfly, Opera’s web developer toolkit. The beta is, of course, free to try. If you’re interested in what’s new in the world of browsers, I think it’s worth a look—between the new features and the UI redesign, Opera 10 for the Mac looks to be yet another strong contender for my browsing time.